Savvy Spreadsheets: Download a free Super Starter Budget template + get 30% off upgraded budget templates! Are you working hard to stick to a budget right now? If so, you’ll definitely want to check out the ! — founded by work-from-home mom Janet Kim Dagostino — is an all-in-one marketplace for beautifully designed, downloadable, Excel templates for all of your daily, weekly, and monthly needs. They offer over 70 downloadable templates — ! The best part? Unlike the usual complicated spreadsheets, are created with the everyday person in mind. They are simple, user-friendly, approachable, practical, and fun to use! Each spreadsheet is compatible with the latest version of Excel, and many can even be used with Google Sheets. Savvy Spreadsheets offers numerous and other personal finance templates to help users track and save their money. 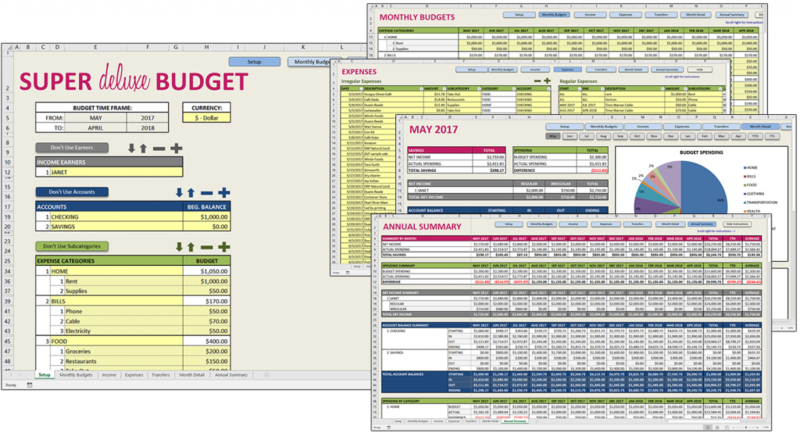 Their “Super Budget” series templates are their most popular spreadsheets, and they have nifty features such as interactive, guided instructions, and buttons to add, remove, and move rows. I recommend downloading their to get started. This helpful template is a FREE one-month budget template that lets you track your spending for up to 10 expense categories. The Super Starter Budget is perfect for you if you have a regular income and don’t need to analyze your spending in great detail. The works just like the Starter version, but gives you up to 20 categories and lets you analyze your spending for a 12-month period. This template is great for those looking for a straightforward budget template that can track monthly spending for a full year. The is their premium budget template, loaded with features to let you really drill down into your finances. With the Deluxe template, you can budget by categories and subcategories, input both regular and irregular income, set recurring expenses, track account balances, and much more. The Deluxe is perfect for those who have irregular income, have recurring expenses, or just want a really comprehensive picture of their financial situation and spending habits. Save on the Super Basic or Super Deluxe upgraded templates! Are you interested in downloading one of the ? If so, use coupon code MSM30 at checkout to get 30% off your purchase! This coupon code is valid through July 31, 2017. Psst! Don’t forget to check out their . You’ll find household management forms, daily calendars and planners, packing lists, bucket lists, goal tracking sheets, grocery shopping lists, and SO much more!